Fellow blogger Sarah Cornelisse recently tweeted a link to an Entrepreneur.com article on the biggest trends in business in 2013. One of the trends included the popularity of hot sauces. Hot sauce production is one of the 10 fastest-growing industries in the US reports IBISWorld, an industry analysis firm. 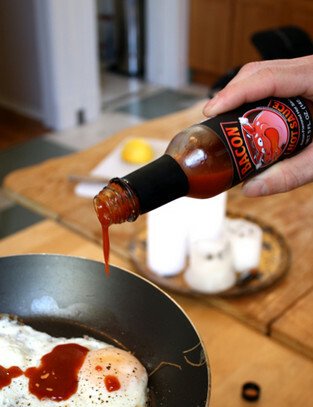 Why is the hot sauce industry expanding so much? Both Dave DeWitt (producer of the National Fiery Foods & Barbeque Show) and IBISWorld point to the increasing popularity of international foods. In the Entrepreneur.com article, they illustrate the increased sales of hot sauces. "Research firm Mintel reports that sales of sauces and marinades--including hot sauces--jumped 20 percent between 2005 and 2010 and are expected to increase another 19 percent by 2015." An article on PreparedFoods.com also discusses the popularity of spicy flavors. In 2011, the “Packaged Facts Food Shopper Insights Survey” showed that 53% of U.S. grocery shoppers “somewhat” or “strongly” agree they “like hot and spicy foods" with a percentage rise to 58% among Gen Y (born 1977-1994) adults. The article also says that, "The same survey revealed that a majority of adult shoppers seeking global foods purchase Mexican and Chinese/Japanese flavored items. However, a larger percentage of Gen Y adults than adult shoppers in general seek out Indian/South Central Asian and Middle Eastern flavors. This indicates a broad interest in global flavors of all kinds." By knowing your target audience, you can develop the best marketing plan for your product. For example, the “Packaged Facts Food Shopper Insights Survey” showed that 58 % of Gen Y respondents "like hot and spicy foods". 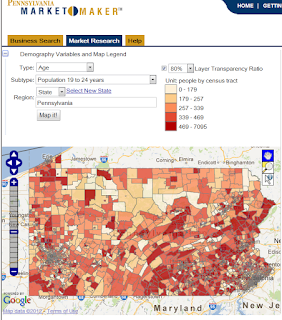 By looking at demographic information on PAMarketMaker.com, you could find where the highest concentration of Gen Y adults are in Pennsylvania (see Figure 1). Thus, you can target the release of your product in areas where your audience is most highly concentrated. Figure 1. Population concentration of 19 to 24 year olds in Pennsylvania. 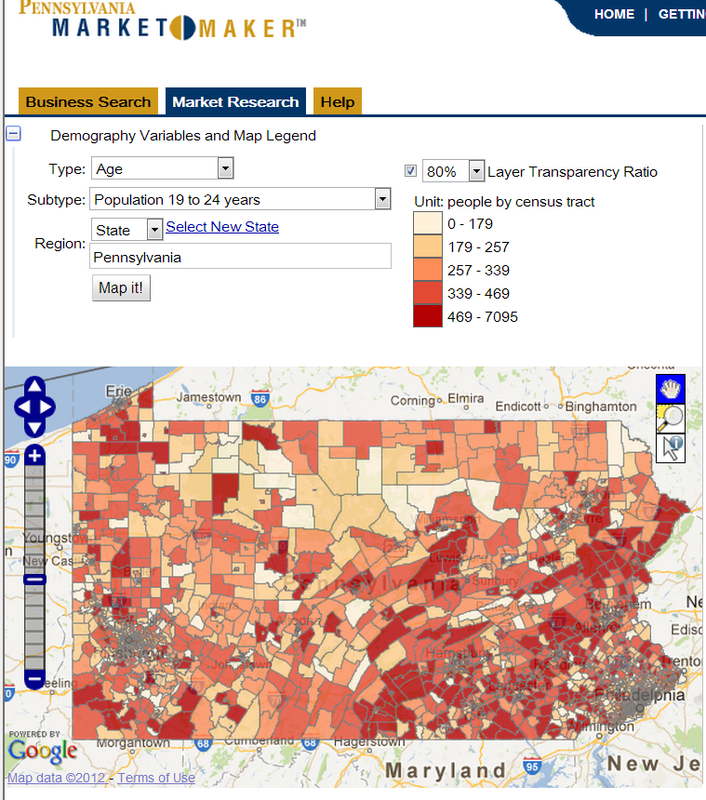 Check out the Resources tab on PAMarketMaker.com for more information on using demographics in developing your marketing plan as well as relevant industry information.